Throughout the morning there was a steady stream of people partaking of either a ‘Full English’ cooked breakfast or a bacon sandwich. Other options included cereal, toast and fruit juice. There was as much tea and coffee as you could drink! Many people commented on the quality of breakfast and every plate came back empty! Chef Helen Samways was ably supported by her willing band of helpers: Paul Arthurs was Chief Waiter and was kept busy collecting the orders and delivering the full plates of break-fasts. There was also a staunch band of volunteers in the sink for the washing-up. Thank you to everyone who contributed to the success of the morning. 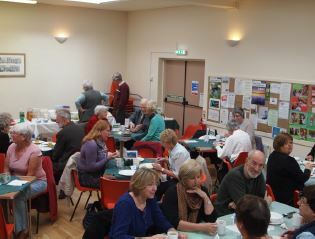 People also generously supported the raffle, which made a profit of £83. Helen took the surplus bacon to work and subsequently made an extra £30 selling bacon sandwiches to her colleagues! After all the bills were paid a cheque for £288 was sent to the Treasurer. To add to the atmosphere in the Hall there was a video of some of the children from La Hoya and Bombita in their COPA schools. A few pictures showing what the villages had been like before COPA arrived emphasised the difference that COPA has made over the last 25 years. Thanks to everyone that supported the event!